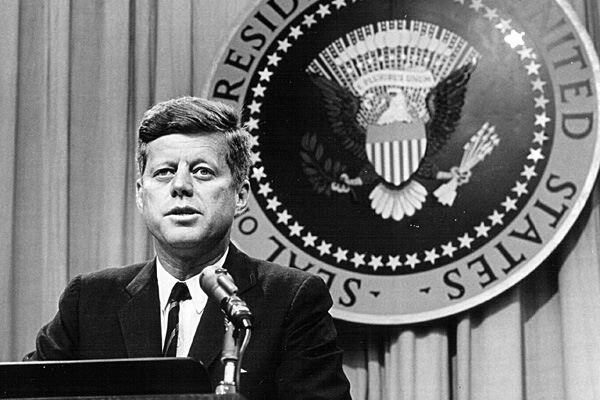 Kennedy was President of the United States from 1961 to 1963. This is the question you would answer if you studied the Cold War option at the end of 3rd Year. There are three different events that you learn about in that chapter (case studies), so you must pick a leader associated with one of them. Of the three (the Berlin Blockade, the Korean War and the Cuban Missile Crisis), the easiest to write about is one of the leaders during the Cuban Missile Crisis - US President John F. Kennedy. Like other people you learn about in 3rd Year, you probably knew a few things about Kennedy already, such as that he is the most recent US President to have been assassinated. His brother Robert ran for President in 1968, but was also assassinated before the election. His other brother Ted became a Senator, which he remained until his own death in 2009. Kennedy was the first Catholic to become US President, and his visit to Ireland in the summer of 1963 was a huge event for the Irish people. His assassination in Dallas, Texas on 23 November 1963 shocked the world, and has been the subject of conspiracy theories ever since. None of that is important to this answer, however, because it specifically asks you to talk about a crisis in the Cold War. In Kennedy's case, that's Cuba, so let's start. Name the leader and the crisis you're talking about. You must make this clear first of all. Give a brief explanation of Cuba and Castro: when did he come to power? What kind of state did he make Cuba into? Why was this a problem for America? What did Kennedy try to do about Cuba first? Explain the Bay of Pigs. After that, he sent U-2 spy planes. For what reason? What did one find in 1962? The Russian fleet was heading towards Cuba. What did Kennedy do? What would have been the consequences if one side had attacked the other? Khrushchev backs down. What did Kennedy do next? Name the leader and the crisis. Explain Cuba and Castro (briefly). The Russian fleet and the Blockade. The consequences of an attack. mention anything about Kennedy that isn't related to the Cuban Missile Crisis. Don't talk about his assassination. get confused between this crisis and either of the other two you study.